Cycling culture is a term which is nebulous enough that it can mean significantly different things to different people. To some, it will bring to mind images of hipsters and the fixed gear scene, or the likes of the counter-cultural Critical Mass movement. To others, it will invoke the BMX scene, or road cycling clubs, or people who live and breathe mountain biking. The one thing linking all of these ideas of cycling culture is that their members all take the bicycle and make it a significant part of their identities. Because of this, I find it weird when “cycling culture” is discussed as a cause of cycling being a mainstream mode of transport in The Netherlands. The implication is that Dutch people are not choosing how to travel primarily based on their experience of their environment, but because of some sort of unique “cycling culture” which is a part of being Dutch. This implies that this ill-defined “cycling culture” would need to be somehow replicated in the UK in order to allow cycling to become a mainstream mode of transport here. Some people may make the further inference that replication of this Dutch “cycling culture” is sufficient in itself to allow cycling to become a mainstream mode of transport. Also worth noting is that just because driving is the dominant mode of transport in the UK, it does not follow that the UK has an equivalent “car culture” which is a part of being British. Certainly there are car and motorsport enthusiasts who make the car part of their identities, but this is hardly typical of the average person in the UK. I also occasionally see arguments that the use of cars as status symbols in the UK produces a culture of driving and works against the cause of cycling as a mode of transport. Whilst there are also people who spend a lot of money on cars which they see as status symbols, these are also the kind of people who will spend money on other conspicuously expensive items in exactly the same way. It is the display of having the means to buy the car which is important, not the car itself (or the watch, clothes, house, boat, etc.). Again, I don’t see this being a major factor in the dominance of driving as a mode of transport in the UK. This kind of behaviour can also be seen in The Netherlands. Just owning a car is not in itself much of an indicator of socio-economic status nowadays. The truth is that The Netherlands has no cycling culture and the UK has no car culture. What both countries have is people who choose how to get around by picking the path of least resistance, based on their own experience. Whereas for British people choosing the car is usually the path of least resistance, for Dutch people choosing the bike is often the path of least resistance. This is not due to a difference of culture, but an result of the differences in the built environment. Certainly, there are also additional non-infrastructural factors increasing the attractiveness of cycling in The Netherlands, such as the provisions organisations and businesses make for people travelling by bicycle, but these are a reaction to the transport choices people make, not the main reason they make them. This reaction serves to reinforce the effect of the built environment on transport choice, as it does in the UK. The argument that The Netherlands has a particular cycling culture which we would need to somehow replicate here for cycling to become a mainstream mode of transport is at its best cargo cult thinking, and at its worst, acts as an excuse for inaction and a quiet acceptance of the status quo. Infrastructure is the foundation of cycling as a mainstream mode of transport. Nothing else will stand up if that foundation is not there first. Last week the deputy prime minister announced something like £1.10 for every individual in the UK is to be spent on cycling per year for the next three years. I imagine that planners in Whitehall and the various local authority offices around the country are thinking how best to use this money to make the bicycle into accessible transportation for all. I thought I would compile some suggestions. People usually choose the path of least resistance when it comes to travel, both in the mode they choose and the route they take. A handful of advertisements on bus stops, television and radio should be sufficient to overcome this basic core component of human psychology. When cycling amongst motor vehicles, people tend to want to minimise the speed differential between themselves and other types of vehicle. The fact that this can lead to sweating is a well known factor keeping people off bikes and the logical solution to this is earmark some cash for a fund which will enable employers, schools, pubs, restaurants, post offices, banks and retailers to provide shower facilities for those cycling to their premises. Poorly maintained bikes are a big barrier to cycling, with many new bikes being used only a handful of times before before their owners, mindful of the wear and tear caused to bikes by actually using them consign their bikes to the shed, for no other reason than this. Safety is a big concern for would-be bicycle users. Unfortunately the roads and the motor vehicles which use them are an unchangeable part of the environment, which we are as powerless to change as the tides or the natural processes leading to the continuous warming of the Earth’s climate. Thankfully we have two powerful solutions at our disposal, polystyrene hats and fluorescent waistcoats. When used together they completely solve al problems relating to safety. Should significant sums of money be spent to significantly improve the experience of people travelling by bicycle on a single major route, or would the same resources be better spread much more evenly across the land? Whilst improving a single route to Dutch standards would significantly increase cycling participation and the safety of those on bikes in one area, it is far better to use the money for thousands of ASLs, sharrows and training places to help people cope with roads whose designs disregard their needs. Spread the money around so everyone benefits, much like pouring a bottle of Ribena into a reservoir. When talking with some colleagues in the tea room, the topic of bad driving, and more specifically bad overtakes came up. After hearing a few stories, I shared a few of my own horror stories of close passes on national speed limit roads from a cycling perspective. After this, the topic of cycle helmets came up, so I dutifully explained that the reality of cycle helmets falls short of what the general public often imagines. From across the room, a chap chimes in with a story from the days when he used to cycle in to work. He told jus that several years ago, he was riding his bicycle without lights, in the dark down an unlit country lane. He collided head-on with another chap on a bike without lights. Both were injured, the other chap quite badly so. Personally, I’d have gone for lights. Yesterday, for the first time in almost two years I seriously considered buying another bike. I have yet to decide whether or not I will buy (yet) another bike, but I discovered something about my relationship with cycling in the process. More astute readers may have noticed that the pace of posts on this site has slowed down somewhat. During this quiet time, cycling has remained my main mode of transport and I cycle approximately 9 miles every weekday as part of my commute, in addition to running errands at the weekend. Despite this, I have not felt the inspiration to post much of anything, or to ride much beyond what I need to do to get around. However, since I started to seriously entertain the possibility of acquiring another bike I have been feeling the call of the pedals and the desire to blog once more. It strikes me that a big part of my enthusiasm for cycling (and blogging about cycling) stemmed from a near-constant series of acquisitions of bicycles and bicycle-related stuff in the quest for the ‘perfect’ set-up. Once I had a set-up which worked well for me, the quest was over, or at least it slowed down. Whilst my ideal set-up will naturally change over the course of my life, the significant amount of research, trial and error required to get to what I have now was what kept this blog regularly updated for as long as it was. The problem with having a set-up which works well for your needs is that there is little left to discover, nothing to be researched into meticulously for hours on end. Nothing to blog about. This realisation led me to notice a pattern. For example, during the time the blog has been quiet, I spent quite a lot of time researching kitchen stand-mixers, intended mainly for the benefit of Ms C’s baking. I wanted to make sure we got the best one that I could also service myself, have good spares availability for years to come at the best price point. Similar to bicycles, there is a surprising amount of information, opinion and even tribalism (Kenwood vs KitchenAid discussions can get just as heated as any obscure bicycle forum thread) surrounding stand mixers. That peculiar world, and many others like it held my attention for much longer than I would have expected them to. Once the stand mixer had been chosen, I ended up learning about bread making, flours grains and a similar series of events occurred all over again. I suspect that my inspiration to write about bicycles and bicycle-related issues will wax and wane over time as the set-up I have becomes more or less suited to the situations life throws my way. Perhaps the simplest solution would be to turn this blog into one which discusses whatever it is that I’m trying enthusiastically to perfect at any given time. Reading Beyond the Kerb’s open letter to the legal system got me thinking about the mass delusion we suffer from in the UK when it comes to driving a car. Musical ability is something which some people are blessed with. Some people are extremely accomplished musicians. Some people are competent singers. Some choose not to participate, but within them lies potential which could one day be nurtured. Some people are tone deaf. There is absolutely nothing wrong with not being musical. Other than not being able to join a choir or an orchestra (or at least, not a good one) being tone deaf will not significantly diminish your life, bar you from a significant number of jobs or cause exceptional hardship to you, or your family. Our collective delusion is thinking that driving a car in a public space is different. Some people are extremely proficient and enthusiastic drivers. Plenty more are competent. Some do not drive, but would be able to do so safely with sufficient training. Some people will are not capable of driving in a consistently safe manner. There is absolutely nothing wrong with falling into the latter category. What is wrong is a system which allows people who are incompetent to drive to gain a licence. A system which allows people who have demonstrated their inability to drive, to continue driving. A system which places the convenience of an individual driver above the safety of innocent third parties. A system which gives no justice to this whose lives are ended, or irrevocably changed, typically through no fault of their own. It is understandable that when confronted with a list of injustices like those described on Beyond the Kerb, we feel incredibly angry about the sheer injustice of it. I know I do. However, I do not feel that imprisoning drivers who kill through incompetence rather than malice achieves a great deal. Drivers who are imprisoned seldom receive permanent driving bans. In fact, driving bans shorter than the term of the prison sentence are depressingly common. When a driver’s incompetence results in a death or maiming, the only just outcome is to stop them from driving, permanently. Naturally it follows that the testing and monitoring of drivers needs to be made fit for purpose as well, to prevent these tragedies before they happen. Having said this, being banned from driving, or being unable to pass the test in the first place shouldn’t diminish your life. Other than being prevented from working in driving jobs, not being permitted to drive should not bar you from a significant number of jobs or cause exceptional hardship to you or your family. The difficulty is that with a transport system in which the odds are so heavily stacked in favour of the private motorist, it seems exceptionally easy to weasel out of a driving ban on the grounds of ‘‘exceptional hardship.’ Subsidised car use, bicycle infrastructure which is non-existent and public transport has been left to decay for decades before the remainder was converted to dividend mines for private shareholders means it is easier to pretend that driving is something that all adults can and eventually will do to an adequate standard. Until we tackle the systemic disadvantage which non-car travel has been placed at for decades in the UK, the delusion will continue and innocent third parties will continue to pay. In the previous post, Transport Security, the link between energy security and transport was discussed along with the implications for the future here in the UK. One of the issues touched upon in that post was the importance of a diverse mixture of transport modes. In transport as in nature, diversity is important. In agriculture, monoculture is the practice of growing a single, large and genetically (almost) uniform crop. This practice might be expected to provide certain benefits due to economies of scale, but it is not without its problems. A uniform crop has uniform susceptibility to disease, pests, weather conditions. This makes the whole crop vulnerable to resilience problems when the crop is subjected to unforeseen external stresses. It is uniformly welcoming or unwelcoming to specific animal species, which can have numerous and varied unintended consequences. There are obvious parallels between the practice of agricultural monoculture and the transport monoculture we have allowed to develop in the UK. In the UK, transport is currently dominated by the private car. It could even be said that this dominance has reached the point that the UK is a transport monoculture. This is compounded further by The Department for Transport’s own predictions that the next two decades’ growth in transport will further increase the total proportion of trips made by car. Cycle use is predicted to stagnate. As in agriculture, a transport monoculture is vulnerable because of its uniformity; in the case of our car monoculture significant vulnerabilities include uniform reliance on inefficient use of fuel and uniform reliance on inefficient use of space. A good example of when these vulnerabilities have been exposed include the refinery blockades for the former and the few weeks of snowfall the UK has seen in each of the past few years for the latter. Both of these types of events are examples of stresses on the UK transport system. As in nature, a more diverse mixture of transport modes is more able to cope with stresses such as those discussed above. During a fuel shortage, modes which rely less on inefficient use of fuel such as bicycles, walking and public transport are in a good position to relieve some of the strain. During heavy snow, modes which use space more efficiently such as bicycles, walking and trains can more easily and quickly have sufficient space cleared to allow their safe passage. The same is true of freight. Diversity allows the weaknesses of a particular mode to be complemented by the strengths of another, and builds an element of much needed redundancy into the system. These other modes are not without their own disadvantages and a transport mix which relies too much on trains or bicycles would be similarly (although perhaps less overall) vulnerable to unforeseen stresses. Whilst it can be tempting, when faced with ridiculous straw-man arguments, to suggest that the UK could manage perfectly well without cars, their continued availability compliments the vulnerability of bicycles to high winds or of trains to staff disputes. 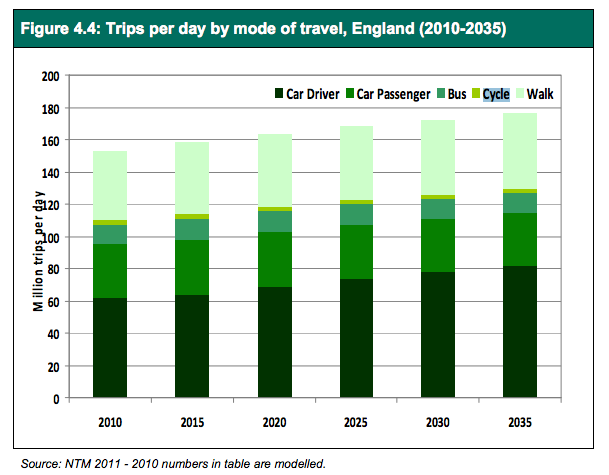 Cars are only a problem at the moment because their near-total dominance of transport in the UK. Our road infrastructure is designed around them at the direct expense of the viability of walking and cycling. The public subsidy of car use leads to perverse economics which make local bus services ‘economically inviable‘ and allow road haulage to uncut rail freight in a manner which simply should not be possible. Increasing the diversity of the UK’s transport mix means directly addressing these problems. Road infrastructure should be designed around cycling, walking and motorised vehicles, not just motorised vehicles. Transport investment should include significant investment in rail rather than just motorised road transport and the external costs arising from motor vehicles should be shouldered directly by their users rather than shared by everyone. By removing the perverse incentives strongly favouring motorised road transport in the forms of private car and road freight above all other modes we can more evenly spread the UK’s transport needs over a more diverse range of transport modes. This shift will increase the overall energy and space efficiency of transport in this country, currently dominated as it is by the most inefficient modes, as well as strengthening transport as a whole against the predicted and unpredicted stresses encountered the future.